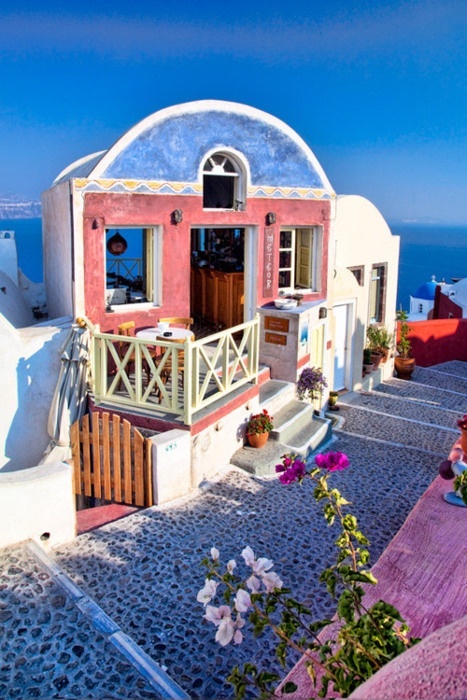 he traditional architecture of Santorini is similar to that of the other Cyclades, with low-lying cubical houses, made of local stone and whitewashed or limewashed with various volcanic ashes used as colours. The unique characteristic is the common utilisation of the hypóskapha: extensions of houses dug sideways or downwards into the surrounding pumice. These rooms are prized because of the high insulation provided by the air-filled pumice, and are used as living quarters of unique coolness in the summer and warmth in the winter, and also as premium storage space for produce and especially for wine cellaring: the Kánava wineries of Santorini.